Ennis and I are excited about this holiday forum. Christmas is a special time at the LazyL and we always do it in a big way. Ever since my mama came to visit us for our first Christmas together in 1976, we've been hooked on the holiday. Anyway, I thought it would be fun to share Christmas at the LazyL with all of you...and you can share with us. I'll be posting updates about what we're doing...maybe some pictures. You can do the same. Maybe send Christmas greetings, pictures, recipes, gift ideas? Whatever, I think we can have fun. Take good care, everyone. I look forward to hearing from you! Oh, I have a Christmas wish, if anyone wants to pass it on to Ennis (hint, hint)...this year the 75th anniversary edition of the Joy of Cooking comes out. Wow! I am still using the same old one that was in the house when we moved in...I think it was publshed just after World War II (1946). If you look at this picture, mine is the third one up from the bottom. I really think I deserve a new one, don't you? I just realized that my cookbook is practically as old as me! It is absolutely lovely to see you here! I have a Joy of Cooking cookbook meself, it is not the latest edition but it is not as old as yours either. Can you convince Ennis to come by here and post a message sometime? I know he doesn't like hanging out on the internet much, but could you try to convince him to come leave a message here? I am looking forward to your updates and pictures! Love to Ennis. I just have one question - when did you learn to cook, Jack? I thought you couldn't cook worth a damn but were pretty good with a can opener (although, I must admit, I always thought you were saying that in a completely tongue-in-cheek manner, so to speak, and that your potato-peeling technique is *way* too polished for someone who doesn't understand it at all). OK, two questions. Do you like pecan pie? I got serious about learing to cook in the summer of 1976 when Ennis and I ranched up together at the LazyL. 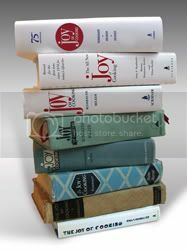 That old copy of the Joy of Cooking was my bible that summer. Most everything I tried came out great except for the infamous Crab Mongol. (I'll bet you dollars to donuts that that recipe is not in the new cookbook!). That first Christmas, sort of as a joke, Ennis gave me a copy of The Fannie Farmer Cookbook . It has turned into a tradition and every year he gives me a new cookbook. After 30 years, I have quite a collection. One of my most prized cookbooks is an autographed copy of Mastering the Art of French Cooking, signed by Julia Child, herself! Of course, even though I have the book, I have not mastered the art of French cooking...in fact, I would say I am a miserable failure. Although I can make a quick and easy simple cheese souffle. As for pecan pie, of course I like it! Is there someone on this planet who doesn't? Well, my husband for one does not like it. Other than that, I can't think of anyone who's ever actually had a decent one who doesn't. Since I'm making him a chocolate cream pie this year, I'd be honored to make my other two favorite men my signature Southern bourbon pecan pie. I like to make mine with Southern Comfort - it's a bit of a Thanksgiving tradition. But if you'd prefer a different brand, let me know. I aims to please. 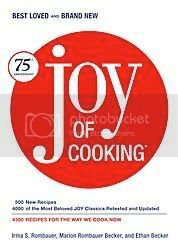 And since I like you so much, I'll slip a note to Ennis with it saying that a little birdie told me Jack would love a 75th Anniversary edition of Joy of Cooking this year. And one more thing - it's so funny you mention The Fannie Farmer Cookbook (and that Ennis bought it for you as a joke). I learned to cook on that sucker - it was the only one we had in our house when I was a kid, so like the Joy of Cooking you found, I took to it like white to rice. Ennis says love to you too. I'll try to get him to post. He's kinda shy about posting, although we all know he loves surfing the Internet. You want ta send us a pecan pie, I ain't complain'. One less thing for me ta worry about. Although you may need to send via our friend MaineWriter...mail delivery is sorta unreliable in this part a Texas but MaineWriter is planning to drop in for a visit. Well, now that's a funny story. Ennis got the idea to buy me a new cookbook that first Christmas--sorta as a joke since I'd be using the Joy of Cooking like my bible, as I said. He told me that he went into the bookstore thinking he'd buy a book, that's it. Well, that was the first time he ever set foot in the cookbook section of a bookstore and needless to say, he couldn't believe his eyes! He had no frigging clue what book to buy and high tailed it out a that store like a cat being chased by a hound dog. He called our friend Jeanie Campbell and she was the one who suggested Fannie Farmer. Ennis went back to the store, found the book, and bought it...all the while thinking this was going to a be a great joke gift. The joke was on him because like you, that book was a godsend. There's stuff in there that isn't in the Joy of Cooking and vice versa. Even though Ennis has given me dozens of cookbooks since then, this is still the one that is the most special to me and I use it often.